My name's Peter and I am from Sunny Southern California (Los Angeles to be exact). I am completely new to gardening but would like to start my own vegetable/fruit garden in my backyard. This seems like the right place to learn and I'm very excited to be here! I plan on making divided raised beds horizontally across the rear of my backyard (behind the stones) to plant different kinds of vegetables/fruits. 1.) How many hours of sunlight must the area get for optimal vegetable/fruit growth? 2.) There is a very severe problem of flys in my area, and they basically surrounded the two loquat plants you see in the far right of the picture, causing us to have to trim the branches and get rid of the fruits. Is there any way of preventing the fliys from approaching my vegetable garden? 3.) Will planting vegetables/fruits attract even more ants? If so, do I spray the roots of the vegetable plants with pesticide? 4.) To my current very limited knowledge, I know that I basically add dirt + compost and plant my plant in there, water it based on type of plant it is ... What other things should I watch out for? To start with coming in to summer, if you are in a hot summer area, might be a tough time to be starting fruits and veggies. I don't know how close to the coast you are, so how hot your summer is. Where I am, I would say most veggies and fruits do best with at least 8 hrs full sun. But if you are in hot dry summer part of SoCal, a lot of things would probably benefit from some shade from hot afternoon sun. Is the area you are talking about next to the fence, where the shrubs are now? If so, does the fence shade it? Or are you talking about in front of that, where grass is now. Flies do not ordinarily bother veggies unless there is something rotting/ dying. Perhaps the loquat fruits were left on too long or were split? The other reason people sometimes have flies around a plant is if the plant has a lot of aphids on it. The aphids excrete a sweet sticky substance called honeydew, that attracts flies. Anyway in general flies should not be a problem. Ants also generally do not eat/bother live plants. They are not really a problem in the garden and may help aerate the soil. No reason to put poison on your food plants to get rid of them and there is hardly ever a reason to spray anything on the roots of your plants. The main thing you need to think about first is the quality of your soil. You want good enriched organic soil, loosened up a good ways down. Best thing you can do for your garden is start a compost pile (read in our Compost Forum for more information). But in the meantime you can buy bagged compost, mushroom compost, aged composted manure, etc to add to your garden plot. It might be late to try to start a vegetable garden now. But you can use the time to really prep the soil well to plant in the fall. Is that a solid fence in the back. 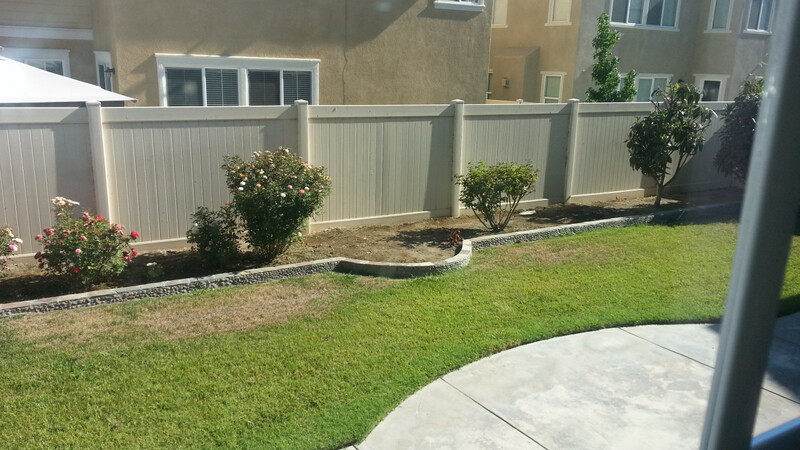 It may cause a problem with air circulation and block light if the fence is solid. You should avoid planting anything closer than 18 inches in front of a solid fence. Use a garden fork and poke holes in the soil. Start collecting browns and greens. The link gives you a list of each kind. If you have a big freezer. I have saved kitchen waste in the freezer for my worms, but it also works as greens for the garden. Otherwise ask the neighbors to save their green trimmings after you have stockpiled the browns. You can also sometimes get greens from stores. Coffee grounds can be gotten from starbucks, but you will need to reserve them early a lot of people ask for them. No dig (lasagna garden) can be set up now and be ready to plant in the fall. While you are waiting for the right time to plant. Check out the fall planting dates for your area. The link below is to a begining gardener guide for California.